Spanish newspaper Marca is reporting that Valencia CF is interested in signing Nicolas Pareja who currently plays in Spartak Moscow. Nicolas Pareja is 27 years old, is Argentine nationality and plays as center back. He has played once for Argentina senior national team and 5 times for Argentina U23 team in the 2008 summer Olympics. 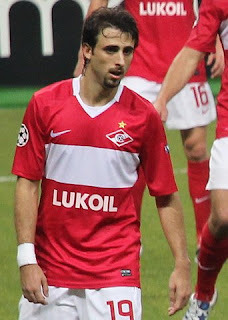 Before he joined Spartak Moscow he played for Espanyol for two seasons and before that he played for Anderlecht for two years as well. Reportedly Braulio Vasquez is going to travel to Moscow where he will meet with Spartak Moscow's representatives and inquire about the possible transfer for Pareja. Valencia CF are said to be offering up to 10 million euros for the services of Nicolas Pareja. Valencia CF has at most 10 million euros for a central defender and this is big money that Valencia wants to spend on unproven player. I'm not sure if this news is true or not, I believe it to be fabricated or maybe sort of inquiry about the player and price which doesn't mean anything, but if this news ends up being true that it is certainly bad business. Nicolas Pareja is not worth 10 million euros, he is barely worth 5 million considering he missed half the season last season and previously he played for Espanyol, not really a big achievement.